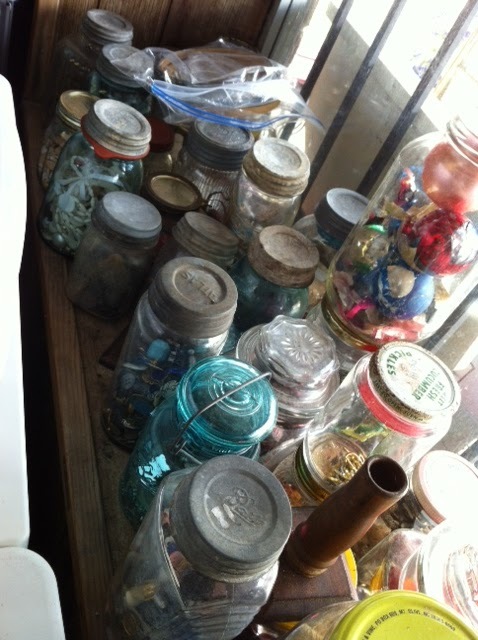 Jars, in the window at the shop, full of buttons, bling and those little treasures I can't throw away. 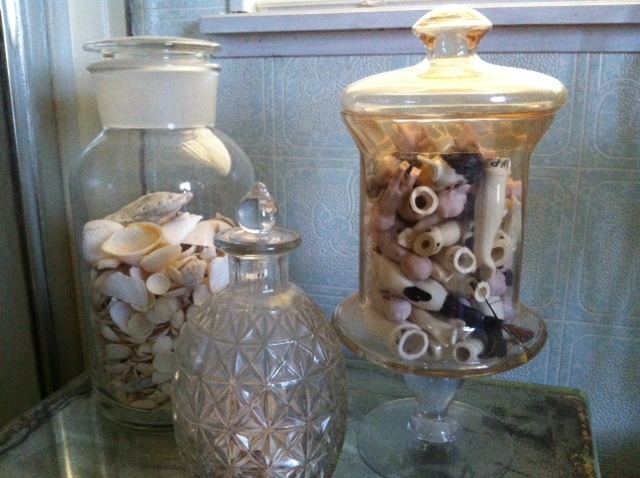 In the bathroom, sea shells and body parts? Just a jar full of doll parts . As they seen to do now. The picture is of a few blue medicine bottles. It is such a pretty blue. 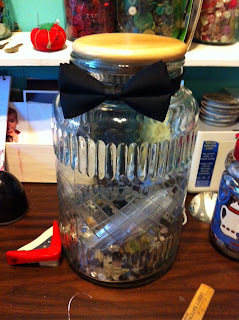 I even have a jar with a bow tie. All dress up and no where to go. Just waiting for more, more buttons. 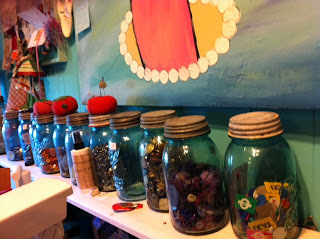 In my studio I pack everything in a jar. A jar on pearls, push pins, safety pins, and jars full of junk. 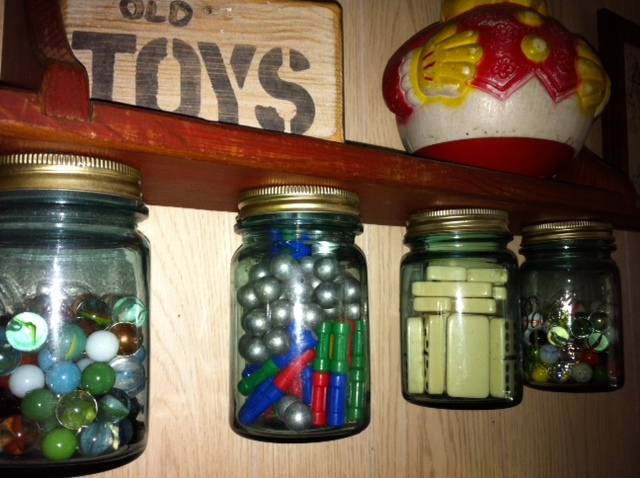 Even on the toy wall is a selection of jars with the not so favorite game pieces. 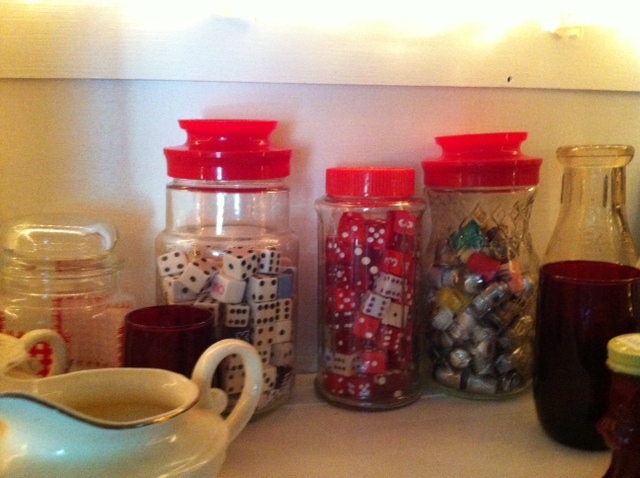 I really don't want them to play with these without an adult, because they never, ever get put back in the jars. But I think they look good. Just a few jars in the china cabinet full of dice and thimbles. I get a new jar and have to fill it up or start a new collection. HAVE A FEW PICTURE OF ONE OF MY MANY COLLECTION. 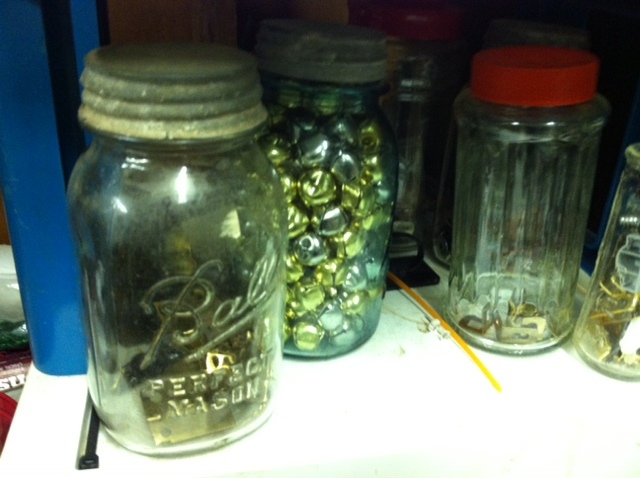 JARS JARS AND MORE JARS. FOR AS LONG AS IT TAKES I WILL POST THIS LITTLE COLLECTION. 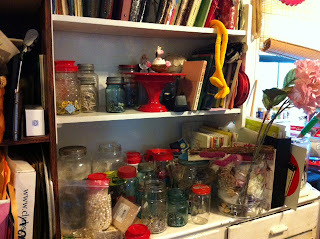 THE LOVE OF THE JARS CAME WHEN I REALIZED THERE WILL SOON NOT BE GLASS JARS. ALMOST ALL FOOD PRODUCTS ARE NOW IN PLASTIC. I THINK PICKLES, MIGHT BE THE ONLY ONE LEFT. SO, ONE DAY OUR GREAT GRANDS WILL NOT KNOW WHAT A GLASS JAR IS, LIKE OUR KIDS DON'T KNOW WHAT LIFE WAS WITH OUT A REMOTE WAS LIKE. MY PARENTS REMOTE WAS....KID GO CHANGE THAT CHANNEL. 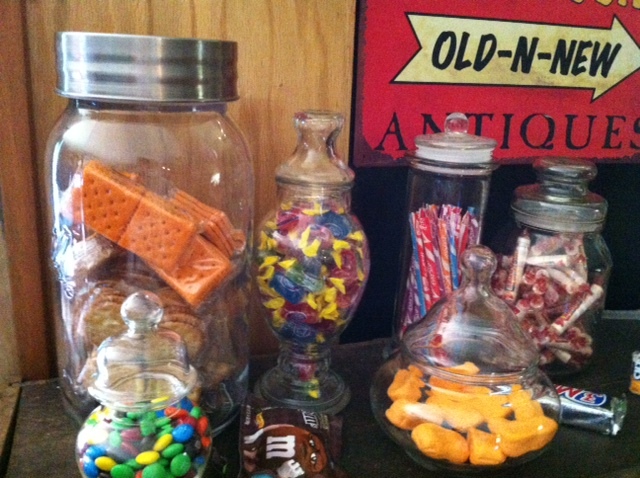 THESE JARS ARE FILLED FOR MY 3 GRANDS, THEY WALK IN MY HOUSE HUNGRY. SO THEY ARE JUST FOR THEM...AND HUBBY TOO! 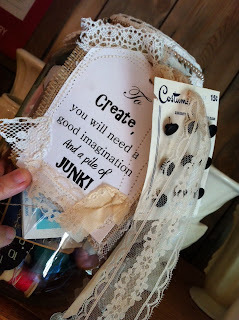 My sweet friend started this........thanks, Linda!!! 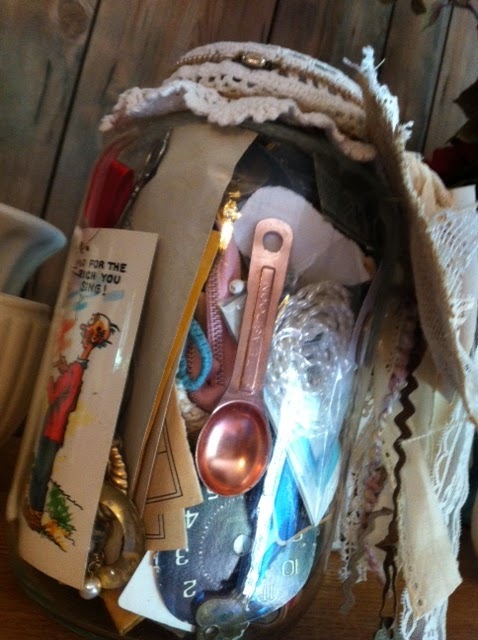 Linda gifted me a jar full of treasures for my 50th all in red. I still love it and empty it and look through all the treasures often. 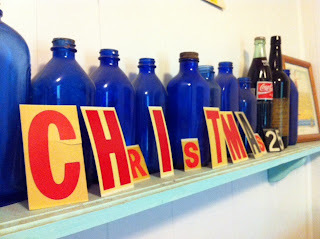 With that said, I have copied her gift idea a few times. Once when Tonya moved into her new house and this jar full of JUNK for a crafty friend, that is graduating soon. She is a crafty girl, that paid her rent one month, selling her crafts. She is a sweet sweet girl and I wish you all the luck and lots of inspiration. Have I told you I enjoy baking? I would bake all the time if I had someone that would eat it. 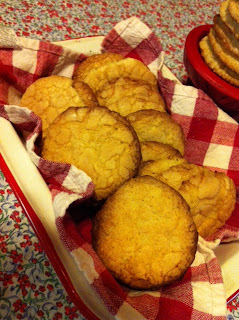 These are tea cake cookies. My grandmother and Aunt Toots made these. Sometimes I just have to bake them. Come by the shop tomorrow, I will be passing out cookies. 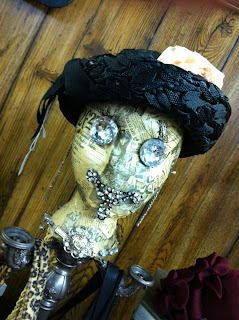 Love, Love Love what Barbara June done to this styrofoam head. She is a unique chic. Now I have one and have to try and come up with a idea. 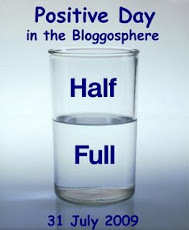 Have you ever had creative block? Well, for the last 2 weeks, I have been. I am trying hard to create with no success. What ever I make, I trash. I hate it when I am blocked. Do you see where I went over the weekend? 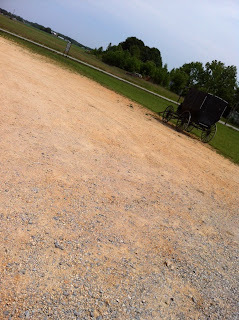 It was a trip to Tennessee to see the Amish. Had a great time and it was a needed trip. I had been ready these Amish books and thought I would love to live there. But the first farm we stopped at, I stood and took it all in. The air was cool and there was a breeze, so I could smell the hog pin or the horse poo. So I climbed back into the car and let the idea of living among the Amish go. But I did get Butter, bread ( still warm from the oven), homemade jam, pickled beets, and a few pot holders. I enjoyed the day, wanna go back, next time with a truck , so I can get a few rockers.